June 16th had been on my radar for a couple days. Day 3 outlooks from the Storm Prediction Center were calling for a broad target area across Nebraska and South Dakota where the strongest instability lined up with a forecasted low level jet maximum. 40 to 50 knots of deep layer shear along with storm motions generally parallel to the surface boundary juxtaposed with a strong low level wind field made the forecast look primed for supercellular storms and a few tornadoes. I left the night before and drove to Austin, MN where I spent the night. The Storm Prediction Center went moderate risk with the 13z update highlighting an area along and south of the I-90 corridor centered around Sioux City. Surface winds were looking to stay backed in eastern South Dakota and Nebraska while a developing lee cyclone tracked east from the high plains. Given the dynamics and buoyancy profiles, there was a slight risk of a significant tornado or two. My plan was to drive west and setup in Sioux Falls for the day. I crossed into South Dakota just after 17z and there were two ongoing clusters of storms. Morning convection to my south across Eastern Nebraska and a line of storms riding just north of the I-90 corridor in South Dakota. 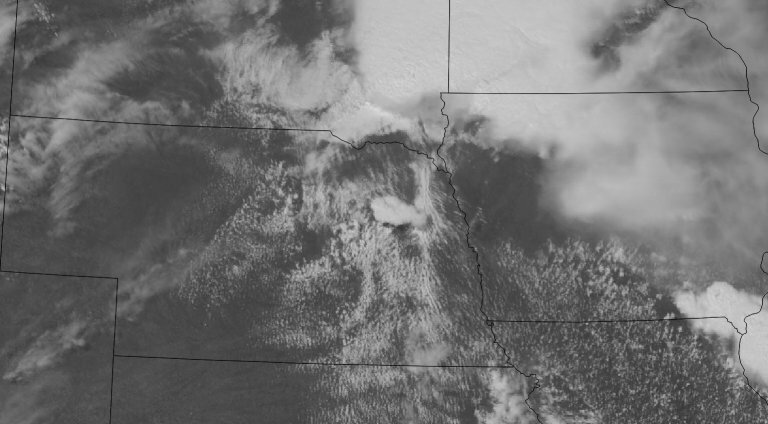 Looking at visible satellite, at the time, I was concerned the cloud cover behind the morning convection in Nebraska would cause instability to be an issue and thought the only chance for the day was the opening in the cloud decks between I-90 and Northern Nebraska. So, that sets the stage for how I expected the day to play out. I was looking to play the tail end charlie of the northern complex for redevelopment as it tracked through an area that remained relatively cloudless throughout the morning. So, there was a narrow window from the SD border to I-90 I was looking to play. Mesoanalysis was showing pockets of higher EHI and STP in this narrow area, even an axis of 500 m2/s2 SRH. HRRR had helicity tracks plowing right through KFSD area, so I stuck with the storms here to see what they would do. I, effectively, focused on the garden showers the northern complex was producing and stopped even paying attention to how Nebraska was clearing out to the south. It’s not even 19z yet and I’d been wandering around the Sioux Falls area following these random rain showers at the tail end of this line for a couple hours starting to get that feeling in my stomach that this day was already over. Prepare to hit your forehead with your palm as I begin the next part of the story. It was around this time I remember messaging Rob Hurkes lamenting that the day was pretty crappy and that I was going to call it a day. Yes, that is correct, it’s June in the Northern Plains and I have called the chase before 19z and already begun my trek back east on I-90. Eventually, I got a message from him that they were going to Nebraska, and that made me think “uh oh, what did I miss?” and I pulled off just as I crossed back into Minnesota. 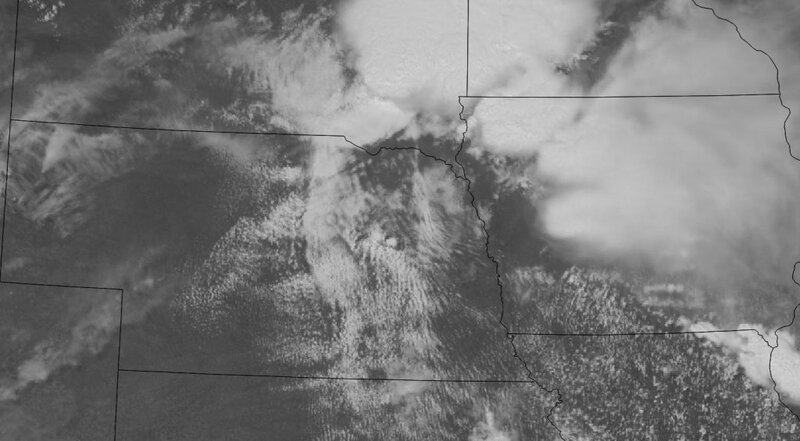 I pull up the visual satellite image and, of course, northeast Nebraska is cleared out behind the morning MCS and a very healthy cumulus field is in place. I turn around at 19z and begin to blast west on I-90 in a last ditch effort to get down there before storms explode. It doesn’t take the Pilger storm very long to get going as just 20 minutes later it’s a full blown supercell. Well, crap. When that satellite update comes in, I am just getting around the south side of Sioux Falls onto I-29. I’m at least two hours out. I finally cross into Nebraska south of Yankton just before 21z and that’s when the first tornado warning of the event rolls in. SOUTH OF NORFOLK...MOVING NORTHEAST AT 35 MPH. Ok, now there’s a confirmed tornado on the ground. About 25 minutes later the tornado warning comes out for Pilger as the storm is bearing down. I’m just south of Hartington still 40 miles or so away. My plan is to head down to Wayne and head east and catch the storm as it heads towards Wakefield. Eventually, I catch up to the storm as the Wakefield tornadoes are in progress and starting to wind down. Fire rescue spotters are running back and forth on highway 15 warning people to stop driving towards the storm. It was near here where I caught a glimpse of the rain wrapped tornado to the east, south of Wakefield. The chase is over at this point and I begin the trek home. No photos or video to show for the day and on the way home, I see all the double violent tornado photos and videos on Facebook. I’ve busted on chases where other’s have succeeded on what could be career days for people. 5/24/11 and 5/20/13 come to mind. 6/17/2010 I opted to stay home and not chase since it was in the middle of the week. Then this event happens, another 6/17/10 type event, and I’ve missed it again! So much jaw dropping footage from that event coupled with the fact that I missed it by 20 minutes or so made it quite painful. I didn’t really care for anything chasing related for a bit after that. This opened my eyes to certain aspects of how I perform during the chase in certain situations. When I do single/two day marathon runs I tend to not focus like I usually do when I’m out for multiple days. In this case, I drove 600 miles to western Minnesota into the wee morning hours, sleep for four hours then continued driving for another 300 miles. That can be taxing, and I don’t think it’s necessarily a fatigue from driving thing (I love driving and road tripping), but I just don’t focus on details at that point. I start chasing on auto pilot, I guess. That means I don’t analyze properly or make proper decisions on where to target or intercept. It also means I wasn’t even watching Nebraska this day. I was in the mode of one and done in South Dakota. I honestly don’t even remember looking at Nebraska as a target before the day. I hope this chase log was at least an interesting read, or at least insight into what happens when you bust pretty spectacularly on a day that turns out to be “the one” for 2014. To add insult to injury, I drove all the way home after this event and didn’t even chase the following day which turned out to be pretty good, in nearly the same area, as well.